E.T. is the worst game ever! Short answer. No, not at all. I was originally going to just do one of my “game overviews” of this game, but I feel this game deserves a little more depth than that due to it’s infamous nature. But before I get into why it’s not the worst game ever, lets just recap on the infamy surrounding E.T. for the Atari 2600. Often labeled the “worst game ever” (not true) and often cited as the game that caused the infamous game crash of 1983 (also not true), it was also the spawn of the “rumor” that Atari buried 1000’s upon 1000’s of E.T. carts in the desert as it was so bad (again, not entirely true). E.T. has been the subject of many reviews, ridicule and blame over the years. Most of that comes from people that either do not remember E.T. at the time, did not understand the game or just taking misinformation from the many, many people that have done exactly what these people are doing themselves by remembering the infamy of the game and not the game itself, kind of like a bad game of Chinese Whispers. I decided to read a few E.T. reviews in research for this article and I mostly found reviews by people that would have been either 2 at the time of release or even -20. But as I said, these are people that are acting on the infamy and not the game itself. E.T. is just too easy a target to rip apart and quite frankly, it’s tedious and dull. Now I’ll not sit here typing a defence for E.T. being a great game…cos it’s not. It’s just not “the worst game ever”…not even close. 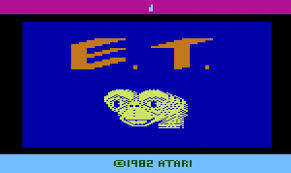 First, a “Little Bit of History”: E.T was was designed by Howard Scott Warshaw who also developed Raiders Of The Lost Ark for the Atari 2600 and both games were relased within weeks of each other. But with Raiders being released just a few weeks before E.T., making Raiders the first ever fully licenced movie video game. E.T. was rushed through development to cash in on the upcoming Christmas season and Howard Scott Warshaw himself was burnt out after developing Yars’ Revenge for seven months and then spending six months on Raiders of the Lost Ark previously. Upon release, E.T. actually met with favourable reception and success. It even went on to be one of the biggest selling games ever on the Atari 2600 selling over 1.5 million units and back in 1983 that was a hell of a lot. The whole infamy comes not from that E.T. 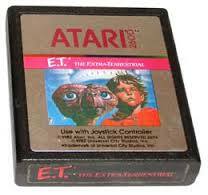 was bad, but due to Atari massively overestimating the gaming market at the time and overproducing the E.T. game cartridges along with many other products. E.T. did not cause the infamous game crash of 1983 either. The game was released in December of 1983, so how could 1 game bring down an entire industry in only a few weeks? So if E.T. did not cause the game crash of 1983, what did? Well, around the same time console hardware and software sales were dropping fast as more affordable home computers started to hit the market. As consoles could only play games, but computers could play games and so much more as well, the computer was a more logical choice for the consumer. The reason the game crash of 1983 occurred was simply due to the fact manufactures like Atari over flooded the market with products no one was buying at the time. There were many games caught up in the game crash, not just E.T. There were great games as well as terrible games. In fact the game crash was already underway when E.T. was released at the end of 1983 and part of the reason it was rushed through development was an attempt to counteract the already plummeting sales at the time as Atari believed a game based on the massively popular film could turn sales around. Yes 1000’s of E.T cartridges were buried in the desert…but so were 1000’s of other gaming cartridges, game consoles and phererials. They were buried, not due to the fact they were bad, but because they were simply unsold and they were unsold because Atari overproduced during a time when the consumer was just not buying. Anyway, about the game itself. For it’s time, E.T. was actually a very innovative game and ahead of it’s time (much like Howard Scott Warshaw’s Raiders of the Lost Ark). Yes of course when you play it today it seems pretty poor…but that is from today’s perspective and where pretty much every (mis)review of this game comes from. At the time however, E.T. was a striking and original game. That is why it became one of the Atari 2600’s best selling games. It had an original concept and it was also one of the very few games that you could complete at the time with an ending and a plot to follow, which was relatively unheard of back then. Is E.T. the “worst game ever”? No, but I admit time has not been kind to it even though it was a very solid game back in 1983. E.T. was very playable back then and offered us gamers a fair challenge. Give it 30 years and games of today will also be getting called “the worst game ever” as some games just do not stand the test of time, but that does not mean they were bad when they were first released. So what is “the worst game ever”? That’s up to you as games are subjective. I just wanted to set the record straight on the undeserved infamy E.T. has. I’d rather play E.T. for a while than any QTE based game anyway. This entry was posted in LBoG: Editorials and tagged Atari 2600, E.T, E.T Atari 2600, Gaming editorials, Little bits of gaming, retro gaming, Retro gaming blog, worst game ever on 14/05/2015 by Steve Perrin.